In this second blog post, I turn to some of the features of what I am calling “secret accounts.” Previously I referred to secret accounts only as the cash ledgers that are packed away discreetly in people’s homes. Most of these ledgers account for simple cash transactions and are rather minimalistic in detail. Rarely are names or dates included in the bookkeeping. When such particularistic details are included in secret accounts, the form and purpose of the account is entirely different. 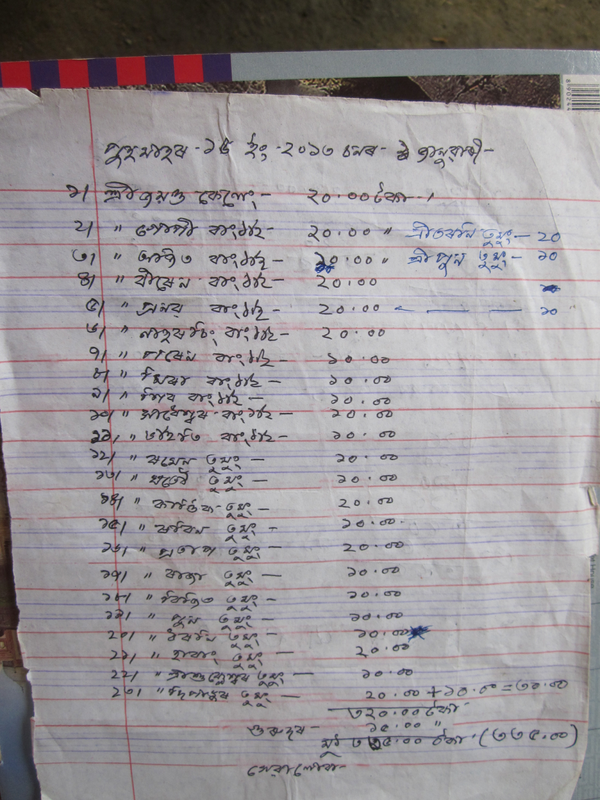 For example, many Mayongians keep astrological life-charts (kusti) in their homes, which present and predict an astrological calculation of one’s entire life course—when and if one will be married, how many children one will have, when and if certain accidents will happen, and when one will die (see Figure 2.1). Like single-entry cash ledgers, these kusti are not to be looked at (especially not by the person whose life they describe) and are rolled up and hidden away as sacred objects. I will not go into a detailed analysis of this form of cosmological reckoning here, but I point them out in order to show that a “secret account” need not always be a literal economic instrument. 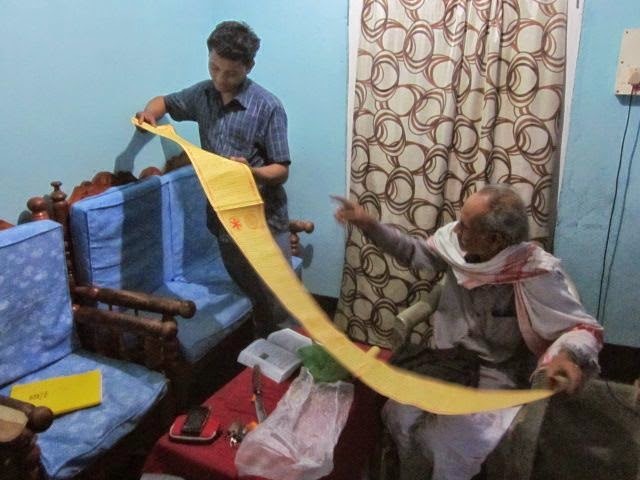 Figure 2.1: One of my research assistants, Tirtha Saikia, reviewing his kusti while his father, Prabin Saikia (a famous Mayongian sorcerer [bej]), chides him for doing so. Kusti are anywhere between one and five meters long, depending on the eventfulness and length of one’s life. They are prepared by local astrologers and created during the time one undergoes a baptismal naming ceremony (oxus; gononi). What unite all secret accounts, however, is their sensitivity to the logic and practice of sorcery—as well as its counterpart, anti-sorcery (or what we might call “dewitching,” following Jeanne Favret-Saada (2015). Moreover, the logic of sorcery presents a serious impasse in ever resolving or closing an exchange with a kind of “final” payment. This, I think, has implications for understanding why secret accounts are kept “secret”—i.e., protected from being drawn into a cycle of sorcery dependency (more on this below). Sorcery (bejali; tantra-mantra) is a kind of service in Mayong. A sorcerer (bej) is called upon to bewitch another, or “dewitch” someone who has been bewitched. Mayongian sorcerers are rather famous and the vast majority of their clients today are not Mayongians at all, but people from all across Northern India. When Mayongians do consult sorcerers, they do not interact with them as clients per se but rather as their kith and kin—usually because they are in need of a cure for sickness or, in rare cases, exorcism in the event of a possession. Payment for sorcery services with non-local clients is almost always implied, although the act of reckoning the payment shifts ambiguously between commodity and gift—usually tending toward the moral logic of a free gift, specifically a “guru gift” (guru munoni; guru dan). 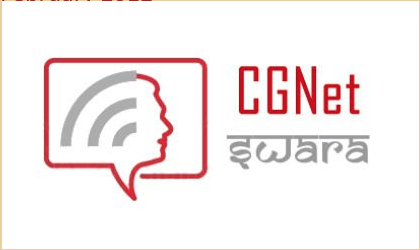 But here the analogy is closer to one of patronage rather than the Indic “guru-disciple” relationship, since it is not technical knowledge that is transmitted, but access to a clientelist network. Sorcerers themselves keep lengthy, detailed ledgers of all their clients, marking their names, addresses, phone numbers, and amounts donated. They are careful to always mark the numerical column as a “donation.” Here is where it gets interesting—these are books that clients are encouraged to look through at length. That is, they are not secret accounts. Some bej in Mayong actually refer to these books as their “network puthi” (network book). Like a thick rolodex sitting on a desk these accounts are meant to be seen and reviewed, thereby illuminating the client network and fame of a particular sorcerer and serving as a legitimate representation of a sorcerer’s power and efficacy. If sorcery transactions are accounted for in terms of gifting, then payment doesn’t really settle a debt (compare to David Graeber's (2011) understanding of the debt-payment relationship), but acts instead as an incitement for further consultations and a deepening of the relationship between a patient/client and his sorcerer/patron. Indeed, out of 37 consultations between a bej and a patient/client that I witnessed during my time in Mayong, only 3 were “one-off” consultations (and these 3 were with Mayongians themselves). As Prabin Saikia, a highly reputed bej, emphasized to me repeatedly: a desire for personal gain corrupts the effect of bejali. A bej cannot “demand” payment, but he must graciously “accept” whatever is given and attempt to give more help than is asked by a client. The terms of agreement are always stated explicitly up front: a sorcerer only can accept payment/donation when given to him freely without asking for it, but giving payment/donation is expected only if the bejali is effective. The thing is, there is always an effect to sorcery, however minor. Suppose someone comes to Mayong to consult a bej; his family is concerned that he has been bewitched and needs to be cured. What ends up happening very often is that an open-ended “patronage-style” cycle ensues, one in which reciprocity is never balanced, and “payment” becomes a means for keeping a relationship open and in play, rather than closed or finalized. Villagers in Mayong are well prepared to speak of how they have avoided getting caught in this kind of sorcery cycle (“Ami salu hoi gol” – “We have wised up”). This is something often looked at as a corrupt practice—taking money for what should be a public service or perpetuating a negative relationship and implicating harm to one’s family in the process. To avoid entry into the sorcery cycle, they keep not only their thoughts protected (refusing to publicly “believe” in sorcery as a real thing, and thus declaring immunity to it). They also keep their account books and life-cycle charts hidden from view, record minimal data, and, in the case of kusti, put strict taboos upon viewing or accessing them. Here, a person’s account ledger and a person’s mind are considered analogous forms of “intention” (obhipray; mon). Both risk the threat of manipulation by sorcerers. The stakes are equally high whether in one case it is the victim’s (or her family’s) livelihood, in the other the victim’s sanity and social survival. Effectively, the secrecy of secret accounts amounts to a way of masking one’s intentions. Even if secret accounts were somehow revealed, techniques of opacity, minimalism, and obfuscation would render them unusable by sorcerers and mitigate any potential threat to one’s economic or social well-being. At the very end of my fieldwork period, mobile money platforms began to make their way into the Mayong bazaar. Shops were now advertising M-Pesa (through Vodafone) and Airtel Money. To what extent Mayongians will actually take up these services remains an empirical question. But my guess is that, initially, it will be very few. Having used Airtel Money to pay for my own services while I was conducting fieldwork, my Mayongian friends to whom I showed my account were most often baffled by its application and use. While the population of Mayong is “banked” (most families have bank accounts at the local branch of the State Bank of India), very few villagers actually use the bank: long lines, a perpetually broken ATM, and paperwork in English are irritating inconveniences. Mobile money would seem to offer a convenient service. But, mobile phones are not “private property,” so to speak; they are shared and passed around freely. Data is shared and it is common for someone to pick up another’s mobile phone without asking and look through the pictures, music files, or whatever data can be found therein. Hence, there is a potential risk of revealing too much if one can access one’s secret accounts in another’s mobile phone. Furthermore, none of my friends in Mayong were interested in the technology as a means of payment. They were more interested in how they could share money with friends and family—how to make gifts and how to recharge a negative prepaid mobile balance from someone else’s positive balance. In so many words, when I showed them my mobile money account, they were interested in how it could be used as a shared account, the features of which I will turn to in my next blog post. Favret-Saada, Jeanne. 2015. The Anti-Witch. Translated by Matthew Carey. Chicago: HAU Books. Graeber, David. 2011. Debt: The First 5,000 Years. New York: Melville. We've put together the Spring 2015 newsletter so that you can hear all about our work this year and share it with your friends! From the IMTFI “special sauce” of capacity building, collaborative mentoring and research dissemination, to Guardian Forums, to online webinars, we have been super busy. So check out all of our work in this handy summary. Oh, and don't forget to watch our video! Financial inclusion and well-being are core issues for most professionals working in the area of consumer finance. This is especially true since the Global Financial Crisis. Governments are investing more in research and programs on consumer protection issues, and banks are infusing their communications with emphases on well-being at work and at home. A Western Union office opens in Anse-à-Pitres in 2010. Photo by Erin B. Taylor. How can we tell if people are financially included, or have satisfactory levels of well-being? This difficult research problem has been tackled by hundreds, if not thousands, of professionals. They have developed definitions, scales, measurements, and questionnaires to arrive at an answer. But this data does not speak for itself. Qualitative techniques in complement to quantitative measures and indicators (which our toolkit will be showcasing) can greatly improve our understanding of how inclusion and well-being diverge. Let me explain by taking a tour through our research on money in Haiti. In June 2010, five months after the earthquake that devastated Port-au-Prince and its surrounding areas, I began researching financial practices in Haiti along with Heather Horst and Espelencia Baptiste. There were plans afoot to launch mobile money services there, and we were asked to assess how people were currently using financial services and mobile phones. After mobile money was launched, we returned again to see how people were adapting to it. Mobile money, while a commercial service, is often introduced into countries with the aim of improving financial inclusion. The idea is that having access to formal financial services will have a positive effect on well-being. But is this really the case? To a certain extent, the answer is “absolutely.” While people who are “unbanked” often have access to a vast array of informal financial services, sometimes these are not enough. Formal services are often cheaper, more reliable, and more flexible. They give people a greater range of choices, helping them to organize their finances in ways that contribute to their well-being - and often in ways that we might not expect. paying their bills or doing their shopping. For example, one young man we knew well, Emmanuel, lives in Anse-à-Pitres on the border of Haiti and the Dominican Republic. We interviewed Emmanuel and followed him as he worked and socialized. We also conducted a “portable kit study” in which we asked him to talk about the possessions he carries on a daily basis, including his wallet, any bank cards, his phone, and documents. This combination of techniques helped us to construct a picture of the financial services and interactions he carries out in his daily life. Emmanuel signed up for mobile money so that a cousin of his, who lives eighty kilometers away in Jacmel, could send him money to pay her Sky television bill across the border in the Dominican Republic. In this case, her financial inclusion was not as a person attempting to escape poverty, but as a consumer whose payments were made more efficient through this new technology. Previously, she had sent the money for free via a fleet of fishing boats that travel from Marigot (near Jacmel) to Anse-à-Pitres twice per week on Mondays and Fridays, which are market days on the border. “Financial inclusion” enhanced Emmanuel’s and his cousin’s well-being by saving them time and effort. While this may not seem like a major advantage of financial inclusion, time and effort in fact carry a heavy social cost because they interfere with people's abilities to devote themselves to core activities such as earning a living, looking after families, and relaxing. In contrast, people can have a reasonable level of well-being without formal financial inclusion. Even when people have access to financial services, the transaction costs in using them can be a deterrent. For example, David has been a resident of Anse-à-Pitres since 2002. He has family in Port-au-Prince, Santo Domingo, and the United States. Because he works for the United Nations base in Anse-à-Pitres as a translator, he has an account with Scotiabank in Jacmel. He can use his Visa card to withdraw money “from any ATM around the world,” but in fact he rarely uses formal financial services at all. Instead, he uses the local boat service to send money to his children who are studying in Jacmel. He sends 500 gourdes once per month to pay for their daily living expenses, plus extra money at the beginning of the school semester for fees and uniforms. The boat service may be slow, but David is not in any particular rush. Learning to use a new service, and teaching his family how to use it, poses economic costs and transaction costs, and he does not consider the efficiency gains made to be worth the effort. Yet other people technically have access to financial services, but do not have sufficient resources to make use of them. Here the problem of insufficient income is more important than transaction costs. twice-weekly between Anse-à-Pitres and Marigot, Haiti. Nicolas, for example, also lives on the border of Haiti and the Dominican Republic. He has a wife and two school-aged children, and he earns US$30 per week carting goods, baggage, and people onto the boats that travel between Anse-à-Pitres and Marigot. He earns just enough money to feed himself and his family. He is three months behind on rent payments for his house, and when we spoke with him he could not travel to find better work because he was ill.
Before the earthquake in January 2010, Nicolas sometimes received money from his relatives in Port-au-Prince via both the informal boat service and the formal Western Union office. Few transaction costs blocked his use: the services were located in the center of his town, and he had sufficient time during working hours to visit them. A major benefit of in-depth qualitative research is that it provides ways to identify these kinds of variations and help researchers decide which variables are important. These can then inform the design and use of quantitative methods, such as surveys or mapping, to understand broad patterns or structural barriers. Qualitative research can also assist in interpreting and telling a story about large data sets even after they have been generated. 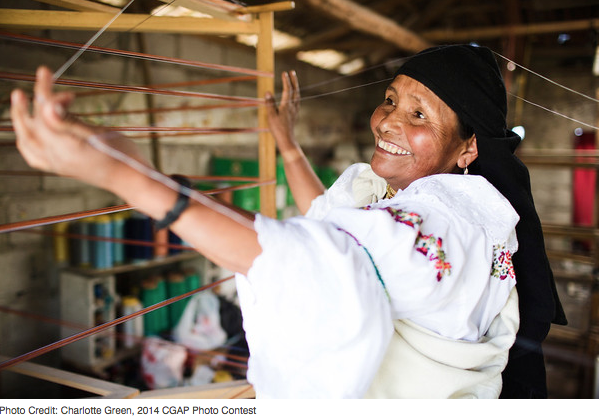 Using qualitative techniques can be essential in defining what financial inclusion or well-being might mean in a given case. Few people are actually financially excluded: instead, they use a range of informal services of different kinds and qualities, and may already have access to formal services even if they don’t always use them—like David. As recent discussions in the financial inclusion space are signaling, a robust research design should attend more to the quality of accounts—how they are used or not used, and to what ends. And for a case like Nicolas’s, we need to be aware that financial inclusion doesn’t just mean having access to financial services, but also the resources to take advantage of them. Money and its management help us to achieve our social goals as much as our physical and practical ones. This point is demonstrated well in the work of Woldmariam Mesfin, who examined the impact of new technologies on payments systems in Ethiopia. Mesfin’s observations in Ethiopia demonstrate the centrality of monetary transactions to social well-being. Giving money to relatives and community members for everyday and ritual purposes is an important way to practice group belonging. Defining financial inclusion by using a more sophisticated suite of tools and techniques, from household savings-to-debt ratios to object centered analysis of money ecologies, can recouple the terms by suggesting whether and how financial inclusion may enhance well-being. The toolkit that we will be building over the next few months will help you in this and other tasks by explaining how different methods can be applied specifically to consumer finance research. 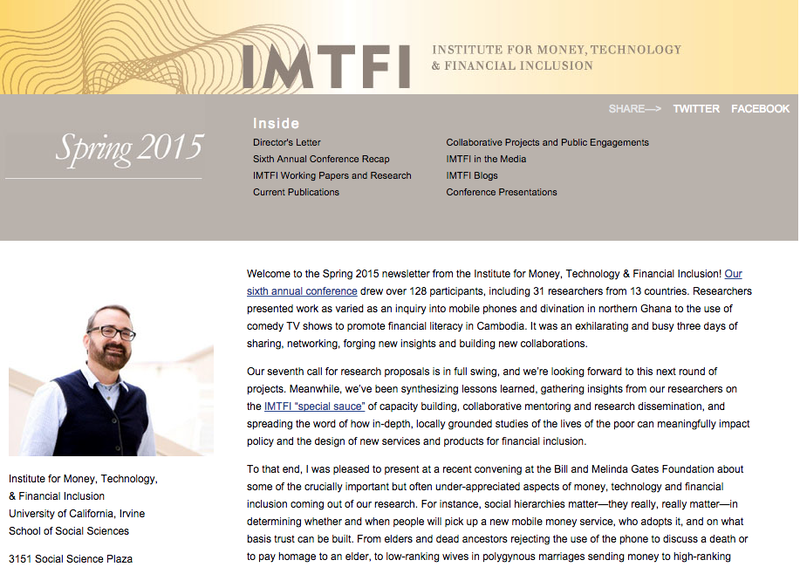 In the meantime, you can keep an eye on the IMTFI blog for more updates and releases. "In recent years, the alarming number of fatalities among migrant workers has stirred up much controversy. Most of the migrants were from countries in the Middle East and South East Asia, and their deaths were the results of unhealthy food habits, mental stress and dangerous working conditions. However, these fatalities are also due to flaws in the policies of the governments of both origin and destination. This book investigates acts of cruelty and abuse against migrant workers which were perpetrated by their employers. The authors argue that migrant workers are often powerless and unprotected by national laws, unearthing new truths on migrant workers as significant economic players. "The incidents of deaths of migrant workers in the recent years are raising serious questions about the security issues and living standards of migrant workers in host countries. However, there is scarcity of systematic research to look into this fact. There are contradicting opinion about the causes of death. The dead bodies carry a death certificate saying that cardiac arrest is the cause for the death while relatives receiving dead bodies at the airport found marks of torture at different parts of the body. In order to explore deeper into the phenomenon, we conducted a research in both destination and origin countries. This research confirms that the cause of their death is not merely cardiac arrest. This book recommends that the safety of the migrant workers should be ensured (from both sides) before migrants set off for the destination countries. "In the last decade the number of deaths of migrant workers overseas has alarmingly increased. Complaints are many. Relatives receiving dead bodies at the airport found marks of torture at different parts of the body. These deaths are not natural ones. Most of the dead bodies arrived from Middle Eastern countries. Cardiologists generally claim acute tension caused by uncertainties of income and unhealthy working conditions and food habits may lead to deaths. 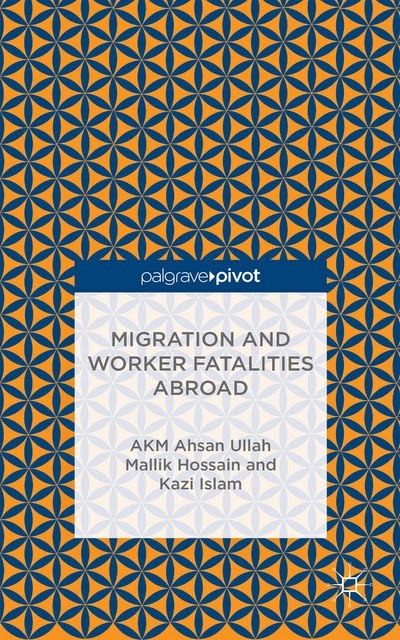 This books delves into the fact the fact to answer why fatalities of migrant workers happen. "This book captures events of cruelty and abuse towards the migrants workers perpetrated by their employers. This book records the level of their defenselessness and unearths a new truth about the migrant workers—significant economic players. This book is an effort to rekindle and strengthen hope for the potential migrants and their families, and to generate collective consciousness about the exploitation and dangerous working condition abroad. Scientists and researchers from all branches of social sciences and policy makers will benefit from this book." See more on Ahsan's project: Unknown remittances of the migrants died abroad: A study on the recovery and dynamics of usage of remittances. 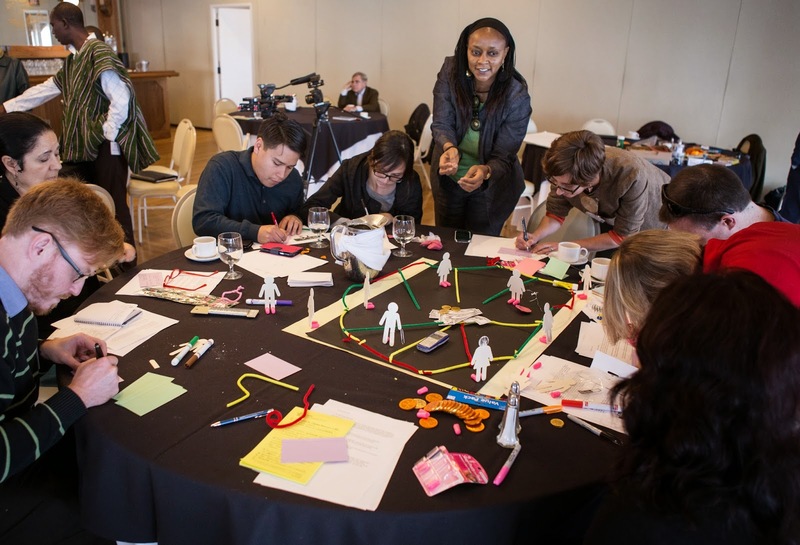 IMTFI Fellow Anke Schwittay has posted an idea showcasing IMTFI's workshop process in OpenIdeo, an open innovation platform for the challenge "How might we use the power of communities to financially empower those who need it most? 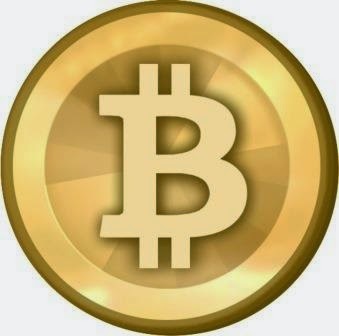 ", it is co-sponsored by CO-OP Financial Services and MasterCard. "As a university researcher and educator in anthropology and international development, I am interested in how academic work can be made actionable. I think the Institute for Money, Technology and Financial Inclusion (IMTFI) at the University of California Irvine, which is funded by the Gates Foundation, presents a very good model for academic, industry, policy and civil society collaborations. IMTFI funds researchers, predominantly from the Global South, to conduct qualitative research into poor people’s everyday innovations with mobile money. Its premise is that only through an in-depth understanding of the complexities of marginalized groups’ financial lives, and the way in which these groups adapt financial services such as mobile money to their own needs, can workable and scalable solutions be found. Over the years, IMTFI has funded 6 cohorts of Fellows working in all parts of the world (for full disclosure, I was part of the very first cohort of Fellows). IMTFI has also used design as a way to make its knowledge actionable. Every year, it hosts a conference bringing everybody together, where it runs workshops and brainstorming sessions. It has published a set of design principles and a report on warning signs for digital client uptake. Because it operates according to an open source model, everything is available to the public and people in industry and policy circles often make use of IMTFI’s findings." See more over at their website. - The concepts resulted in iterative prototypes. As computational systems get more sophisticated, the assumption that calculation errors will get progressively eliminated is one we all tend to make. In this short video, noted human geographer Nigel Thrift briefly reflects on how this is not always the case. 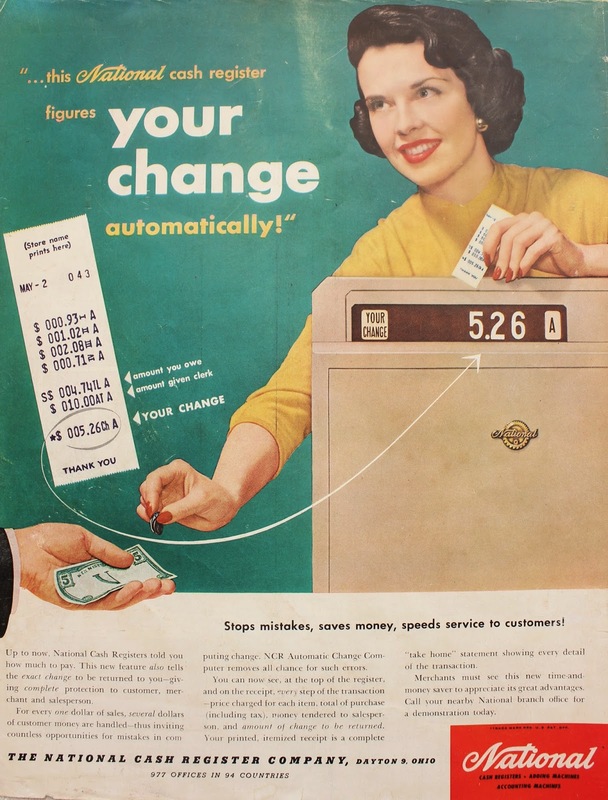 Prompted by an image from the IMTFI archives - a ‘National’ cash register advertisement from 1955 - Professor Thrift reflects on the importance of remembering the persistence of calculation errors within increasingly automated monetary systems. Read more on Professor Thrift’s work on “qualculation” - the many millions of calculations that inform any given social encounter in Euro-American cultures. This is the second in a series of short videos on the material cultures of payment and money started by the blog Transactions: A Payments Archive. You can view the first video, a commentary by Professor Keith Hart (Centennial Professor of Economic Anthropology at the London School of Economics) on the Kina Shell necklace and its connections to the history of anthropological thinking about money, gifts and exchange, here. The full audio recording of Nigel Thrift's talk, "Cities in the Anthropocene" held at UC Irvine on Feb. 26, 2015, is available on the IMTFI YouTube site. *These videos feature excerpts from the song “Jupiter the Blue” by Gillicuddy, available under a Creative Commons Attribution-Noncommercial 3.0 International license. "Despite Herculean efforts from nonprofits, banks and economists, the gender gap between male and female bank account ownership persists." "Women who open a bank account gain greater economic empowerment, save more for things such as health emergencies and their children’s education, and purchase more nutritious food. So says Leora Klapper, a lead economist in the Development Research Group at the World Bank. Yet, while nonprofits, banks, and researchers have made serious strides, the data convincingly (and discouragingly) still shows far fewer women than men own a bank account and far fewer women than men use formal credit." "The numbers show the truth. The 2011 Global Findex Data (which Klapper co-authored) reports 97% of adults in the United Kingdom possess accounts and equally between men and women. In other developed countries, 90% of men and women possess a bank account. 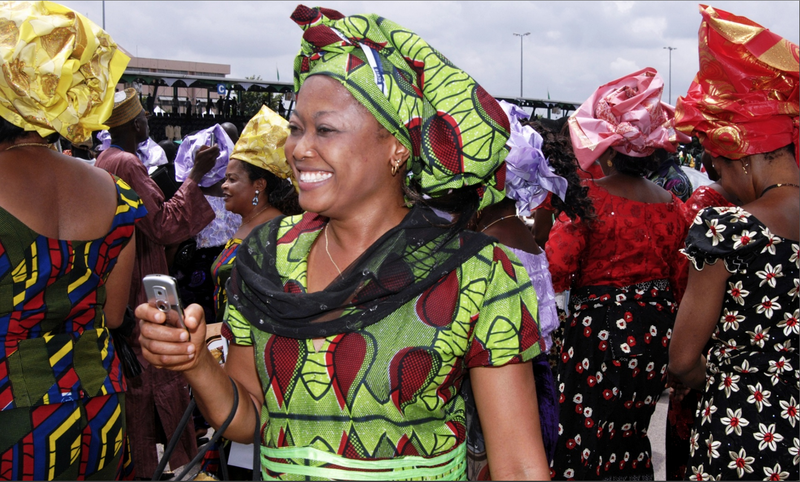 In Nigeria, however, where 33% of adults possess an account, only 26% of account owners are women. Even within the richest 20% of earners in developing countries, a striking 9% gender gap in bank account ownership remains." Mary Ellen Iskenderian who heads Women’s World Banking, discusses a nonprofit working with banks in developing countries to bridge the gender gap, says part of their work is convincing financial service companies that women are indeed excellent clients. “With small tweaks, specific to design and marketing, banks can easily tailor their products to women,” she says. Read the full post by DG McCullough here.